Re-reading Hope Mirrlees’ 1920 Paris. There’s a section that simply documents advertisements in the Paris of 1919. One heartbreaking one: DEUIL EN 24 HEURES. Literally, “mourning in 24 hours,” which wouldn’t be a pun in English but simply a service. In a time and place where almost every woman was in mourning, there’s a service to dye your clothes black. About a mile from my house, on the Newark border, is a t-shirt and skate shop. One of their specialties? R.I.P.s. The Reverend Peter Gomes, the Plummer Professor of Christian Morals at the School of Divinity and the Pusey Minister of Memorial Church, has died at age 68. I am so sad to hear it. I was a lecturer at Harvard from 1994-98 and, during those years, spent many Sundays at the Memorial Church. It’s an intimidating New England building, white, beautiful and austere, anchoring a side of Harvard Yard. To me, a young lecturer on the fringes of Harvard and on the fringes of Christianity, it took a lot of courage to even cross the threshold. When Rev. Gomes was preaching, it was worth it to find the courage. He was the first and best minister at delivering sermons that made you think about the ethical world of the Bible, compare it to our ethical world, and then want to go back into that world, determined to make it better. I never judge ministers against his standard—none could meet it—but I always brighten a bit when I’m in a church and the minister gives a sermon that enacts the process of intelligence working on a great text. What first got me to the church was not Gomes himself but my friend Janet Legro, his junior minister (after years of ministry, she’s now teaching in a Quaker school in Virginia). Part of her job was to line up a daily homily for morning prayers. She asked me if I would do one. I balked. I told her that I wasn’t sure if I believed in God. I told her that I had never been confirmed. I told her I hadn’t read the Bible. That doesn’t matter, Anne, look, there are 12 weeks in the semester and I need to find sixty people each semester, no repeats, to give a five minute meditation on a passage from the Bible. If you say yes, I only need to find 59 more. Of course, I said yes. And, in saying yes, I found that I really should go to the church once or twice, and in going to the church once or twice, I found Rev. Gomes and I went many, many more times. Many have been saying this all day in remembrance, I’m sure, but I will repeat that he was a great, charismatic man. Wholly his own person and one of those wonderful Ivy League originals who exudes intelligence, kindness, and confidence all at once. He was a short man but a great man with a huge, charismatic presence and a beautiful, booming voice. The obituary mentions James Earl Jones and that seems right. He was formal and even a little vain of his clerical robes and a profoundly New England, even Harvardian type. Though I have never met anyone like Rev. Gomes, he seemed to fit in to Harvard completely and the fact that this openly gay, African-American minister from Plymouth, MA seemed to fit in perfectly made me feel a lot happier about God and Harvard. And my homily? It became an essay here. Holland was the author of the essay collection “Endangered Pleasures: In Defense of Naps, Bacon, Martinis, Profanity, and Other Indulgences” (1995) which has risen to the top of my TBR pile. It would have been 1981 or 1982. I was in high school and babysitting on a weekend night for my cool yuppie neighbors. The parents came back all excited from their screening of “Claire’s Knee,” eager to tell me that I reminded them of Claire. To this day, Puritan that I am, I cannot quite imagine myself into the position of a young girl who excites a middle-aged man’s lust. I was a bit freaked out by the comparison at the time. Did that mean that Mr. X…? But Mrs. X was giggling, too? It seemed too gross, too complicated to take in, so I avoided that film for years. But, still, they were very cool. And I filed Eric Rohmer away as a director to watch. When I did, I fell in love. More than any other film director, Rohmer is mine: I love his films and I love his women. I don’t know the Six Moral Tales as well as later films, so I was surprised to read in the Times obituary that his characteristic subject is “a man who is married or committed to a woman finds himself tempted to stray but is ultimately able to resist.” In that telling, he sounds like such a male director, but to me, his films have always seemed really friendly to women. But then, the truth is, I identify with his heroines: nervous women, liable to talk to much, women who wear no make-up, and whose beauty varies tremendously from shot to shot—just as one’s own beauty does. Rohmer always lets you see that his actresses are beautiful. He lets them know it, too. But he also shows them doubting it in moments of stress or shows their beauty and confidence failing them just when they want it. Beauty is not everything, of course, but this is film—French film—and it’s so visual. And, for Rohmer, that raw, imperfect, eccentric beauty serves as a visual metaphor for worthiness—both to oneself and to others. It does not hurt that the women he directed are clearly very very smart: their beauty emanates from their intelligence. 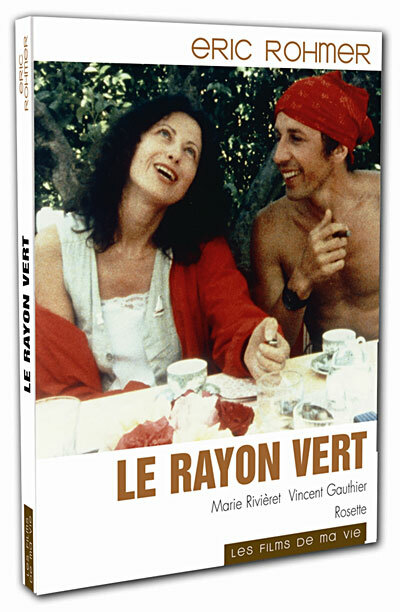 My favorite is “Le Rayon Vert” or “Summer.” It perfectly captures so many of my own vacationing dilemmas in my twenties and thirties. A young woman, newly single, must quickly make plans for a vacation during the national August holiday. She waffles from neediness—she’ll just go to the Alps and pop in on her ex—to friendliness—she’ll just be an easygoing add-on in a big family house—to bravery—she’ll go off to the shore alone. Alone on the shore, her bravery is intermittent. She is rude to cute men and kind to the wrong people. Her loneliness betrays her until she figures out how to be alone. It’s such a painful, uneven, crazily raw performance. It does so many things that an American mainstream chick flick just cannot approach: it allows you to see a young woman’s loneliness, including some of the humiliations of that loneliness, without humiliating her. It shows that loneliness as a mood--her boyfriend just dumped her, after all—not a condition. I cannot get enough of it. Last spring, Lauren hosted Jonathan Baumbach introducing “An Autumn Tale,” a late Rohmer film that shares a lot with “Summer.” I could take or leave the pretentious introduction, but the film itself was a glorious masterpiece: beautiful and interesting narrative, full of rich talk. It—and Rohmer himself—strikes for me, the perfect balance of intellectual filmmaking: still enough of a movie to be fun on a date, but provocative enough to inspire an essay. "Excusez-moi," he said politely, and ducked into the next room, shuffling back moments later with a pile of coloured exercise books. He explained excitedly that the colour of each matched the palette of each particular film. For example, yellow in La Boulangère de Monceau (1962) reflects the colour of bread, whilst blue in Pauline à la Plage (1983) represents the sea. And you can read A. O. Scott’s appraisal of his career here. What a wonderful legacy he has left behind. We're deep in the semester all of a sudden and my inbox is burgeoning with all kinds of texts to read and review. The most literary of the lot: proofing my own prose. It's a lot of donkey work for the next few weeks and I'm finding it hard to leave it behind even in my dreams. Last night? I was an apprentice in a sighted (i.e. not blind) John Milton's print shop, keeping him company as he composed an elegy for John Donne. Then, I fashioned an ear of corn out of straw: the sole decoration on the pinecone wreath. He saw this as a delightfully frivolous touch and wondered aloud at how beautiful the other mourners would find it. He felt that he was really pulling out all the stops. No Puritan, I knew that others would be leaving gaudy wreaths of yellow and gold mums. Still, I saw how starkly beautiful it was and thought that it would be the most unusual and glorious wreath in the graveyard. Strange and fascinating to hear that this Kentucky writer's goal was "if it doesn’t sound too ridiculous — my aim was to be a New York Jewish intellectual" because, for me, I suppose one of my strange aims, since I left Seattle, since I learned who she was at some point in graduate school, has been to grow into being her. Actress Lois Maxwell has died. She was 80. She played Miss Moneypenny--surely one of the great names ever!--in the first 14 James Bond films!